The new M,F& A Mark IV All Fiber Doppler Velocity Interferometer Systems offer enhanced capabilities in the measurement and recording of instantaneous velocity versus time histories. Two versions of the Mark IV Systems are now available. The original Mark IV has been in use all over the world and gives excellent results provided that the target surface of interest is reasonably reflective. In the latest version of the Mark IV we have up-graded to a new ultra-narrow linewidth laser for enhanced velocity resolution. These systems also incorporate the latest developments, such as a new Nickel Metal Hydride power and charging system, new front panel arrangement including a “Balance” knob to easily equalize the “sin” and “cos” signal amplitudes and a digital battery voltage monitor. The new systems are built in a 1U Rack Mount chassis and can be easily up-graded to the Mark IV-3000 by the addition of the EDFA at a later date if desired. The Mark IV-3000 features an entirely new system architecture based on the same ultra-narrow linewidth seed laser but this version incorporates an EDFA with +30 dB gain to boost the relatively weak return light from marginal target surfaces to levels that give high signal to noise ratios at the detection end. This boost in the reflected return light is the equivalent of putting 3000 mW of laser power on the target. However, you won't have to worry about safety issues since this optical amplification occurs entirely within the system chassis. Rather than amplifying the seed laser and putting large amounts of power onto the target, we amplify the reflected light returned from the target. Following the lead of the telecomm industry again, we don't amplify the signal until after it gets weak. The amplified return light is then sent on to the interferometer as before. This approach allows us to use an extremely narrow linewidth (<2kHz) source for velocity resolution down to 0.003 m/s. And with the EDFA boost of the return light we get saturation level signals from surface reflectivities as low as 0.1% with the standard probe. While developing the Mark IV-3000 we experimented with higher power lasers with 100mW and 500mW of output power but found that the higher power levels in these lasers increased the micro-acoustic noise. This leads to wavelength and phase jitter, commonly referred to as “linewidth,” which limits in turn, the ultimate velocity resolution of the system. So we abandoned that approach in favour of the EDFA post reflection amplifier. By putting the amplifier after the target reflection, we can keep the power levels and thus the noise levels extremely low. Another advantage to this approach is that the laser power levels on the target are kept low, so damage to sensitive surfaces is not an issue. And although the performance is equivalent to having a 3 Watt laser in your lab, the safety and protocol issues remain those for a Class IIIb, less than 15mW, laser. Upgrades of our older systems to these new Mark IV and Mark IV-3000 configuration are available, see the side bar. No Mirrors, Beamsplitters or Etalons! A VISAR (Velocity Interferometer System for Any Reflector) determines the velocity of an accelerating or vibrating surface by measuring the Doppler shift of laser light reflected off the surface in a unique form of interferometer. Changes in the velocity of the surface produce changes in the wavelength of the reflected light due to the Doppler effect. The interferometer is sensitive to wavelength and converts these changes in the wavelength of the input light to changes in the intensity of several output light signals. These intensities are then recorded by fast photodiodes in a data acquisition and analysis system. Velocities can be determined with accuracy of ±1% or better, in the range from a fraction of a meter/sec up to thousands of km/sec and with sub-nanosecond time resolution. The surface observed does not need to be mirror polished and changes in it's reflectivity or in background light have no effect on the derivation of velocity. The system requires no calibration and measurements made with it can be considered to be absolute. With this technology there are no limitations on maximum velocity or response time as in the class of devices known as "Vibrometers." And unlike the class of devices recently called “Photonic Doppler Velocimeters,” which are actually nothing more than conventional Michelson or Mach-Zender displacement interferometers, the signals coming from an FDVI or “VISAR” are already differentiated optically and represent velocity directly. The signals from the above-mentioned devices are displacement fringes and need to be differentiated, usually by Fourier analysis, which results in a loss of time resolution. Another disadvantage of the displacement interferometer approach is that the data acquisition must be fast enough to resolve these displacement fringes and for velocities of significant interest to many, this can require extremely expensive digital oscilloscopes with bandwidths of 10 GHz or more. The VISAR is truly a remarkable invention. The pioneers of this technology include Lynn Barker, Will Hemsing, Bill Isbell, David Goosman, and many others. They led the way and deserve the credit for the development of the concept principally for shock physics and weapons research at Los Alamos, Sandia, and Lawrence Livermore National Laboratories. There are now only a very few commercial sources for VISAR systems and the systems offered by others are still based primarily on the technology of the era of it's invention - water-cooled Argon ion lasers, high voltage vacuum photomultiplier tubes, piezo-electric and Pockel's cell sub-systems and so on. At Martin, Froeschner & Associates we have re-invented the system using a wholly new approach. The tremendous advances in high purity lasers, ultra-fast detectors, fiber amplifiers and filters and so on developed by the telecommunications industry and centered on the 1550nm wavelength regime where attenuation and dispersion are extremely low, make this the obvious wavelength to operate in. By analyzing and re-imagining the optical layout of the original VISAR we have developed an architecture which preserves the principles of the original delay leg interferometer. but realizes it entirely in fiber. In the M,F&A FDVI’s there are no free space beams to align, no beamsplitters to position, no fiber to beam couplers to fiddle with, no moving parts, nothing to tune, tweak, hunt for, optimize or adjust. In the VISAR or Delay Leg Interferometer, incoming light is split into two paths, one of which is substantially longer than the other, and then recombined. Optical interference occurs at the re-combination point. For simplicity, assume that the wavelength of the incoming light is such that the delay leg of length L, contains an integral number of waves. Then at the interference point the waves will be in phase and the signal intensity will be maximum. Now, if the wavelength of the incoming light begins to change, the number of wavelengths in the delay leg will not quite exactly match the delay leg length. There will now be a small phase difference at the re-combination point due to the missing or excess fraction of a wavelength. This phase difference results in a change in intensity of the re-combined signals. As the wavelength of the incoming light continues to change, the intensity at the interference point will go through a complete sinusoidal cycle and come back to maximum intensity. Continued change in velocity produces more and more of these cycles in intensity of "fringes" in the output intensity. Notice that the only uncertainty in this constant, and thus in the absolute accuracy of the instrument is in the measurement of the length of the delay leg, L, (0.1%), the illuminating laser wavelength, lambdao, (0.05%) and the index of refraction of the delay leg fiber, nD, (0.01%). These are each measured and certified for every system delivered. The length of the delay leg fiber determines the sensitivity of the instrument to changes in velocity and also the time resolution. In general longer the delay leg lengths produce more sensitivity in velocity. The resolution in velocity depends on how well we can measure small portions of a fringe shift. This depends principally on the wavelength and phase jitter in the laser itself as well as on the noise level and linearity of the photodetectors and data recording system. Our experience is that shifts on the order of 1/1000th or 0.1% of a full fringe are resolvable. This is shown as vres in the table below. The intrinsic wavelength and phase jitter of the laser is the primary limit to velocity resolution since the noise levels in the photodetectors and data acquisition system are generally negligible. This jitter in wavelength is commonly measured and specified as “linewidth” and is given in the Specifications above. For example the light frequency at 1550nm is around 194 Terahertz and with a “linewidth” of 2 kHz we would expect to see the laser output frequency to jitter over the range from 194.000000002 to 193.999999998 Terahertz. This jitter will appear as apparent velocity fluctuations on the order of 0.003 m/s. In other words about 3 mm (about one eight inch) per second, phenomenally small compared to any other system available. The phase jitter of our newest laser amounts to 0.5 milli-radians. In terms of velocity this is about 0.0001 part of a fringe and for a typical delay leg length of 1m, with Kf = 150 m/s/fringe, the velocity uncertainty due to this phase noise is roughly 0.01 m/s. For a 10m delay leg it would be ten times less or 0.001 m/s. The maximum velocity resolvable is limited only by the total number of fringes which can be counted within the record length of the data acquisition system. Typical systems have record lengths of several kilo- to several megabytes. This leads to maximum resolvable velocities on the order of a thousand times the fringe constant. The range in velocity resolvable in any particular system therefore ranges from about 0.001 Kf to about 1,000 Kf. The intrinsic time resolution of the interferometer may be taken as the transit time of light through the delay leg and is shown as tres in the table below. Note that the time resolution of your data acquisition system will also be relevant. 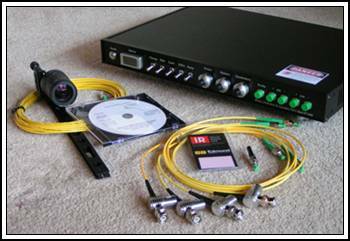 Each FDVI System consists of everything you need except for a digital data acquisition system or oscilloscope and a simple PC. The Mark IV FDVI System requires four channels of data acquisition. The user will also need to provide a trigger to this data acquisition system which is timed to the experimental event so that the data acquisition system captures data at the appropriate time of interest. Note that the FDVI system needs no trigger, it operates continuously. where v(0) is the velocity at the beginning of the experiment, normally zero, m is the number of whole fringes which have been counted since then - the software does this counting automatically and in both directions - and the last term is the current fractional part of a fringe derived from y(t) and x(t) which are the two time dependent signal intensities from the interferometer. A complete software package to do this analysis is included with every FDVI system. The source code is provided in highly modular and extensively commented Fortran and also compatible with most "C" compilers so you can adapt it to your system and preferences. Other software systems to do this analysis are available on the web and elsewhere from their authors. A further detail is that our interferometer actually propagates two polarizations of the incoming light. One of these is retarded by a quarter wavelength relative to the other. As a result, the interference maxima in the two signals are displaced from one another, i.e. they are in quadrature; one varies as the sine of the velocity and the other as the cosine. From these two signals both the magnitude and direction of any velocity change can be determined, i.e., we can unambiguously distinguish acceleration from deceleration. Another improvement over our previous Mark III Systems provides two additional signals which are negative polarity versions of the normal "sin" and "cos" signals. This is the so-called "push-pull" implementation. It was originally discovered by Will Hemsing and has been the standard for years in "conventional" VISARs, those implemented with free-space beams and all the lenses, mirrors and other complex optics these old technologies require. We are pleased to announce that the advantages of the "push-pull" configuration are available in our all-fiber FDVI's as well. The principal benefit of the "push-pull" configuration is that the two complementary signals can be subtracted from one another, either in the software or electronically by a differential scope input. As a result the signal level is doubled and any background is eliminated. In an experiment where backgrounds may be high and signal levels varying, this "push-pull" methodology is very desirable as the uncertainties in the analysis is much reduced. The delay length, L, may be chosen may be chosen to suit the need of your experiment. As a general rule, select a delay leg length so that the fringe constant is smaller than or at most about the same as the velocities of interest in your experiment. Then, hedge towards shorter lengths if you need better time resolution. On the other hand, the overall time resolution of the system will be determined by the photodetectors and data acquisition system, so there is little point in going below this. The lengths in the chart below are provided simply as examples. The shortest built for a customer is 75 mm, the longest 100 m.
Delay legs of 200 mm, 1 m and 10 m are provided as standard equipment with each FDVI System and should cover the needs of almost any experimental situation. Delay legs of any length may be purchased separately if your needs so require. The fiber delay leg is easy to replace. Switching between the standard lengths is accomplished by simply re-arranging standard LC/APC fibre connectors. The standard system contains a focusable variable focal length "CS" mount lens coupled to a single mode optical fiber. This optical fiber carries light from the laser(s) in the FDVI chassis to the lens systems rear focal point. From there the light emerges, is transported through the lens and projected onto the experimental target surface. The light reflected from the experimental surface is focused back to the same point where it enters the same fiber and is transported back to the FDVI System. An optical circulator within the FDVI then separates this returning light from the outgoing light and sends it on to the Interferometer section of the system. A built-in red pilot laser is provided so that visible light can be sent through the Experiment Viewing Probe to assist in aiming of the probe's focal spot onto the experimental surface. The standard probe lens has a focal length that can be varied from 5 mm to 50 mm. The aperture is 27 mm. It is mounted in a standard 1" kinetic optical mount that is mounted on a 12" optical rail. 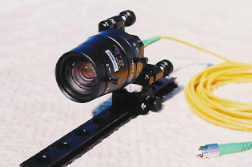 A wide range of other lenses, especially those designed for video cameras, are compatible with this standard "C" thread probe. Adapters for other lens systems such as the various popular 35 mm reflex camera systems are available, as are systems based on microscopes and large optical systems such as Celestron and Meade telescopes. Whatever your needs might be, we can provide the necessary optics. We also provide a series of inexpensive models for high-energy experiments in which the optical probe must be expendable. The optical output signals from the FDVI are converted to electrical signals by M, F & A Series G 10 GHz InGaAs photodetectors. These convert the signal at the last possible moment, right at the input connectors of the scope or data acquisition system, eliminating all of the disadvantages of co-ax cable. They have a built-in load resistance chosen to maximize the sensitivity while keeping the response time at least as fast as the inherent response time of the interferometer itself. High impedance connections are recommended, since there is no co-ax cable. The traditional 50 ohm termination to suppress cable reflection is unnecessary and will reduce signal levels substantially. Other Series G modules are available with a wide range of gain, bandwidth amplifier and connector options. Contact us if your experiment requires upgraded photodetectors. Because of its unique design, proper operation of the All Fiber Doppler Velocity Interferometer System can be verified without having to set up and execute an experiment with a moving surface. Instructions for ensuring that each component is working correctly is described in the manual that accompanies the FDVI. Although we developed the first commercially available multi-beam VISAR back in the last century, we have since found that the savings resultant from running multiple beams through a single interferometer are illusory. And the technique is only appropriate to obsolete configurations based on beam-splitters, mirrors, lenses and other open-space beam optical components. With our all-fibre approach it is far more expedient and cost-effective to simply replicate the system for experiments requiring observation of more than a single spot in an experiment. Several of our clients are using multiple FDVI’s to monitor the velocity of different parts of an experiment, the two ends of a Split Hopkinson Bar, for example. Same as above except that there is no EDFA Optical Amplifier. Choose this version if your target surfaces are of good reflectivity, planarity and integrity. Upgrade to the MarkIV-3000 at a later time is possible. Prices for purchase directly from Martin, Froeschner & Associates follow. For orders with international end users, see INTERNATIONAL ORDERS.